Visit Alyson Beecher on Wednesdays for Non-Fiction Picture Books at Kidlit Frenzy. 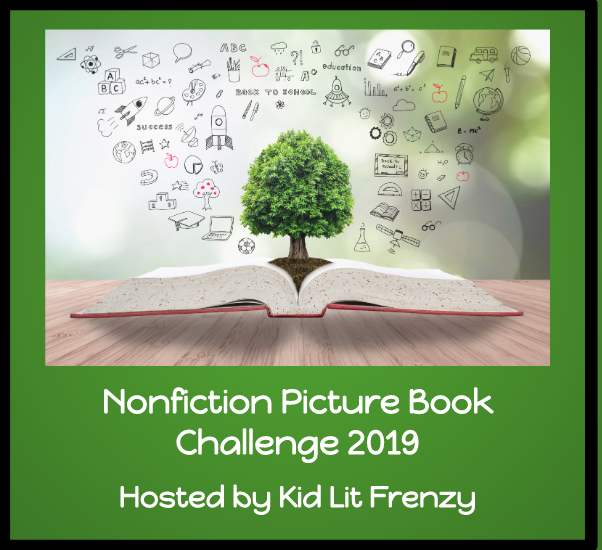 Thanks to her hosting and sharing and those who add their posts discover and celebrate terrific nonfiction picture books! I always learn from these books, am happy that they continue to be available for kids. I hope your favorites received some accolades Monday at the ALA awards. It was certainly exciting to see the announcements. I've read and reviewed some, but not all. Here's the link to the full list if you're interested! Now it's time to begin the 2019 journey of more fabulous non-fiction picture books, showing how-tos and lives, history and nature's mysteries with intriguing text and pictures. 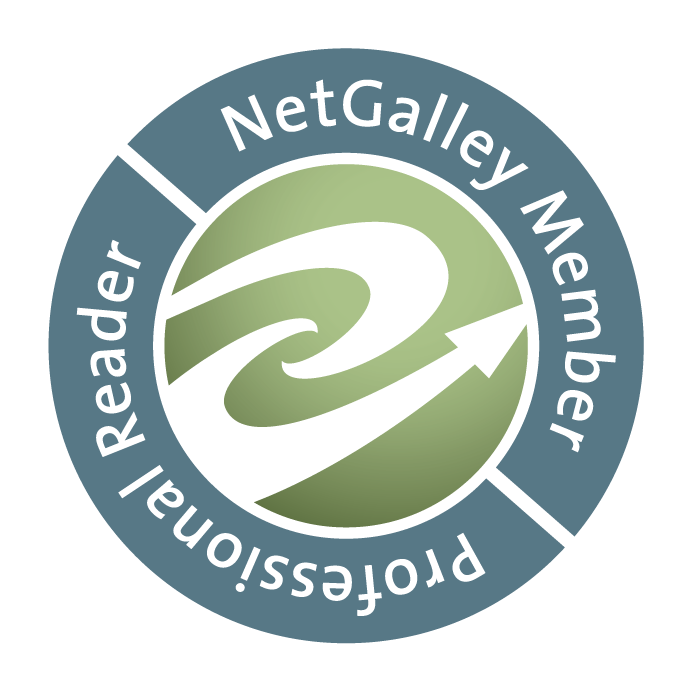 These authors and illustrators create images not soon forgotten when they tell their tales! I'm not sure that I should be sharing much about this book. I grew up with the beginnings of rock 'n roll, had a husband who managed rock radio stations, so I know something of these roots and continued on with my kids listening to hip-hop, but I really don't know much about rap, only a few names and a few raps. 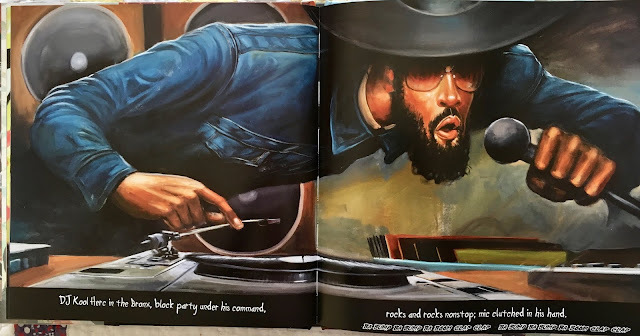 In this new book, Carole Boston Weatherford tells a rhyming history with two lines on each fabulous double-page spread, from the long-ago beginnings to today. 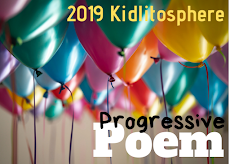 The roots of this musical wonder begin with folktales, street rhymes and spirituals, the book showing Langston Hughes and Paul Laurence Dunbar in clouds with a teen and his t-shirt that says "It was All A Dream", an homage to Dr. Martin Luther King. One review states these are also "the signature words of Notorious B.I.G." It also pays homage to the influence of James Brown in a page spread that shows his energy beautifully. You can almost hear him singing! 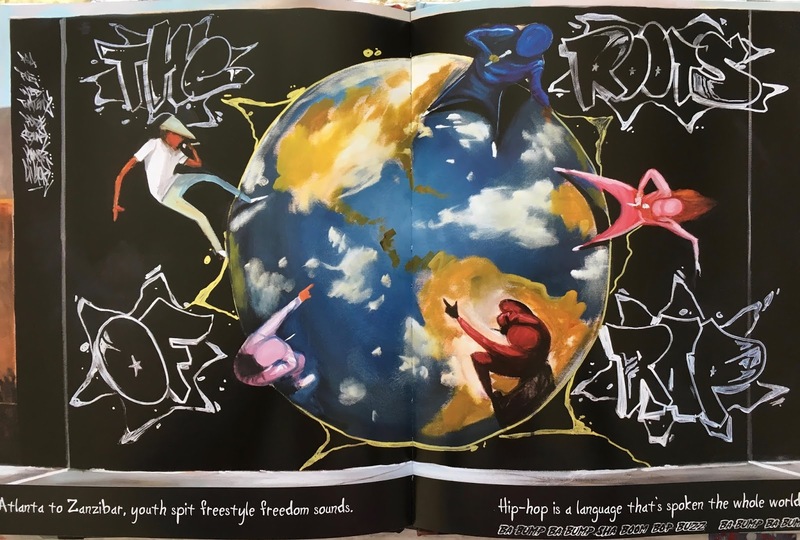 Graffiti and break-dancing mix in, too, in the splashy art by Frank Morrison. 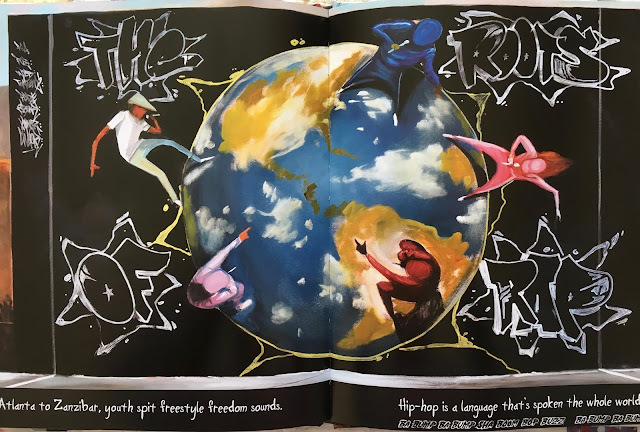 from School Library Journal: "The four pillars (graffiti, break dancing, rapping/mCing, and DJing) each play a role in the 16 bars that make up the book. Weatherford writes spare rhyming text, which follows hip-hop's roots in folktales and spirituals to its current status as a cornerstone of culture." 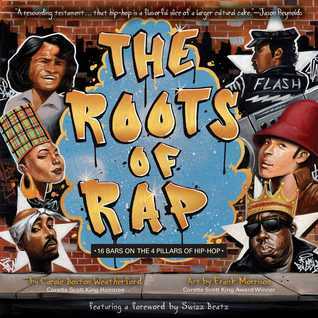 A glossary of classic hip-hop terminology is included along with an author’s note and an illustrator’s note. Carole Boston Weatherford signs her note as "C.B. Dub" and Frank Morrison ends with a rap his brother wrote. Their own portraits on those pages keep the rap flowing as if they're on stage, too. from the book and Weatherford's rhymes: "Graffiti is thrown on buildings, bridges, and billboard signs/all along the Manhattan, Queens, Bronx, and Brooklyn lines." Here's a video of one of the first female rappers, Queen Latifah, mentioned in the book. This book is in my pile to read! The illustrations look amazing! I was surprised at the simplicity of the text. The illustrations are wonderful. The text comprises the sixteen bars of one verse of rap, so I guess that's what Carole Boston Weatherford chose to do in the text. It's rather a celebration of the history rather than a lot of explanation. Thanks, Michele!